A policeman sprayed pepper spray into an unruly crowd at Aloha Stadium when Cincinnati players tried to enter the locker room after a brawl broke out on the field between players and spectators. The Bearcats return to Hawaii for a game in 2008. The bad feelings between Cincinnati and Hawaii have dissipated enough where the schools can play each other in football again despite a brawl at the end of their game in 2002. UH won that Aloha Stadium contest 20-19, as quarterback Tim Chang played the final minutes with a sprained knee. Hell broke loose in the last seconds of the emotional game after Chang was sacked. The end result was some bloodied players, pepper-sprayed fans and two embarrassed programs. Yesterday, UH athletic director Herman Frazier said the Warriors will host the Bearcats on Dec. 6, 2008. Cincinnati is 5-0 and ranked 20th in the nation. Coupled with a home date with Division I-AA Weber State, it completes next year's schedule. The Warriors will play 13 games with five against nonconference opponents. The Weber State game is sandwiched between road dates at Florida to open the season on Aug. 31 and at Oregon State on Sept. 13. Weber State also offers an interesting storyline, as coach Ron McBride was a finalist at Hawaii in 1999 when June Jones was hired to lead UH. The other nonconference teams on UH's schedule are at Florida (Aug. 31), at Oregon State (Sept. 13) and home against Washington State (Nov. 29). When compared to this year's lineup, the Hawaii football nonconference schedule for 2008 looks like a murderer's row. Florida, Oregon State, Washington State and Cincinnati might be just a tad tougher than UNLV, Washington and two I-AAs. And don't forget that UH faces perennial WAC powers Boise State and Fresno State on the road next fall. Backup quarterback Tyler Graunke -- first in line as Colt Brennan's successor -- knows next season will be a challenge for the Warriors, as well as a huge opportunity. "All eyes will be on us if we continue to play well and go undefeated this year," said Graunke, as 16th-ranked UH (5-0, 2-0 WAC) prepared for its game tomorrow against Utah State (0-5, 0-1) at Aloha Stadium. "We could have a pretty good ranking going into next season and a lot of games on national TV. We'll have to step it up and continue the tradition." Athletic director Herman Frazier announced the final two 2008 games yesterday, adding Cincinnati of the Big East (Dec. 6) and Division I-AA Weber State (Sept. 6), both at Aloha Stadium. UH opens at Florida (Aug. 30), plays at Oregon State (Sept. 13) and hosts Washington State (Nov. 29). It marks the first time Hawaii plays four teams from BCS conferences during the regular season. Frazier said he received an e-mail from Cincinnati yesterday finalizing the deal, filling the Warriors' schedule at 13 games. The last time some Hawaii fans saw the Bearcats, it was through burning, watery, pepper-sprayed eyes. 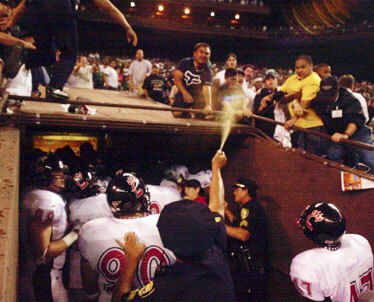 At the end of the 2002 game that UH won 20-19 at Aloha Stadium, a brawl ensued involving dozens of players and spectators. The Cincinnati athletic director at the time, Bob Goin, said UH's lack of event management contributed to the melee. Coach June Jones was ready to play Cincinnati a month later in the Hawaii Bowl. He's getting the rematch six years later. Frazier said he sees no problem with hosting the Bearcats, and indicated that Cincinnati's BCS conference affiliation makes it a more attractive opponent than before. "Not at all. There's new management there," Frazier said. "They're no longer in Conference USA, they're in the Big East. Anytime we play against a Big East team it's important for us. In fact, we targeted the Big East for this game. The other team we were looking at was Syracuse. What it does for us is it gives us a quality team and an opportunity to be on national TV with an East Coast market." The Bearcats are 5-0 this season and ranked 20th. UH's four BCS opponents for next fall are a combined 12-7 this season. "This is a demanding schedule, but we are excited," Jones said. Frazier can't say it of course, but Weber State is hoped to be a glorified scrimmage between tough outings at The Swamp and Corvallis to start the season. But a half-dozen Wildcats hail from Hawaii as well as defensive line coach Chad Kauha'aha'a, who was a standout at Baldwin. Weber State coach Ron McBride will be fired up, too; he was a finalist when Jones was named UH coach in 1999; McBride is no stranger to Aloha Stadium, having coached at Utah when it was in the WAC. UH starting defensive tackle Mike Lafaele attended practice but did not participate a day after he was diagnosed with a strained hamstring. Keala Watson, considered a third starter by the coaches with Lafaele and Fale Laeli, took Lafaele's place with the No. 1's at right tackle. "Mike Lafaele's dirt tough and he'll play if he can," defensive line coach Jeff Reinebold said. "He's going to have a role no matter what. If he doesn't play, he'll be like a coach on the sideline." Reinebold, who coaches from the coaches' press box booth this year, said he normally communicates with Lafaele by phone between series, anyway. About 33,000 tickets had been issued for tomorrow's game at end of business yesterday. ... With Ryan Mouton out with a knee injury and Jason Rivers coming back from a sore back, Mike Washington and Keenan Jones will return kickoffs, Jones said.